An epoxyester linear block oligomer made with n-1 moles fatty acid units terminated with carboxylic acid groups and n moles of epoxy oligomer, when filled with carbon black, is a particularly effective electrically conductive primer for use over organic-based composites to be electrostatically painted. This invention concerns polymers and paints. More particularly it concerns polyester-epoxy polymers filled with carbon black and particularly suited for use as electrically conductive coating compositions for use on automobiles, including non- metallic parts. The present invention is an adaption of and improvement over that of U.S. application No.613,413 (FF-7795),Huybrechts, Meeus and Timmerman, filed May 24, 1984, the disclosure of which is incorporated herein by reference. Coating systems for automobiles normally comprise a multiplicity of coatings applied to substrates of steel and sometimes also other materials, including electrically non-conductive organic-based composite materials. Typically, the steel is treated with a phosphate, then a cathodic electrocoat primer is applied. A primer-surfacer is used next to smooth the surface and provide a thick enough coating to permit sanding to a smooth, flat finish. Then a topcoat system is applied, sometimes as a single colored coat, often as a basecoat with solid color or metallic pigments followed by a clear coat. When a non-conductive material is used for part of a car body, it is important to provide an electrically-conductive coating over it so that when the topcoat paint is applied electrostatically to the entire car, a uniform appearance will be produced. Among such non-conductive materials are reaction injection molded (RIM) parts and various fiberglass filled composites. It is difficult to find a paint that can be made adequately conductive for such applications while still being tough and flexible enough to be a useful paint. (f) 20-80% by weight of organic solvents, having a specific conductivity measured as a dry, cured film of at least 5.10-3 (0 cm)-1. Coated substrates are also part of the invention. 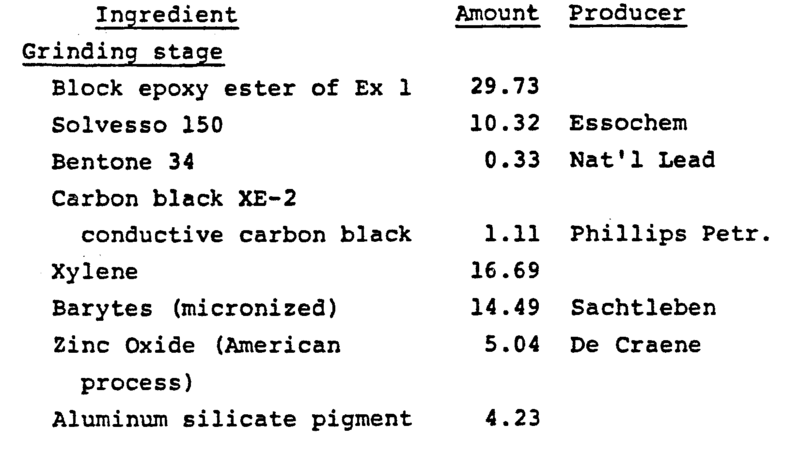 With coating compositions of the invention, the carbon black content was varied and the conductivity of the resulting coating was measured with a "Sprayability Meter" made by Ransburg Electro-Coating Corp. of Indianapolis, Indiana. It was found that at least 2% carbon black by volume based on the total solids was needed to obtain electrostatic sprayability. The following table shows the Ransburg Conductivity rating for various levels of carbon black. A conductivity of at least 100 is needed for a coated substrate to be amenable to electrostatic spraying. Furthermore, the resins of the present invention exhibit substantial toughness, chip resistance and flexibility, making them suitable for use with carbon black fillings as conductive coatings. In the examples, parts and proportions are given by weight except where indicated otherwise. The resulting resin was an oligomer containing 4 moles of Mn 900 epoxy and 3 moles of C36 dimerized fatty acid, for a total of 7 mole units, end terminated with epoxy. Reduce with Solvesso 150 to spray viscosity of 25-30 sec in Ford cup 4. The resulting paint was sprayed onto non-conductive automobile parts and provided a tough coating which could be electrostatically sprayed with a topcoat. (f) 20-80% by weight of organic solvents, having a specific conductivity measured as a dry, cured film of at least 5.10-3 (Ωcm)-1. 2. The coating composition of claim 1 wherein the block epoxy ester is the reaction product of a bisphenol A diepoxy resin with a C36-based aliphatic diacid. 3. The coating composition of claim 1 wherein the blocked isocyanate is a ketoxime-blocked aliphatic isocyanate. 4. The coating composition of claim 1 wherein the crosslinking agent is selected from the group consisting of melamine formaldehyde resins, urea formaldehyde resins and benzoguanamine formaldehyde resins. 5. The coating composition of claim 4 wherein the crosslinking agent is a reactive partially alkylated melamine formaldehyde resin. 6. A coated substrate comprising a substrate of an organic-based composite material coated with a cured coating composition of claim 1, giving an electrical conductivity of at least 5.10-3(Ω cm)-1.